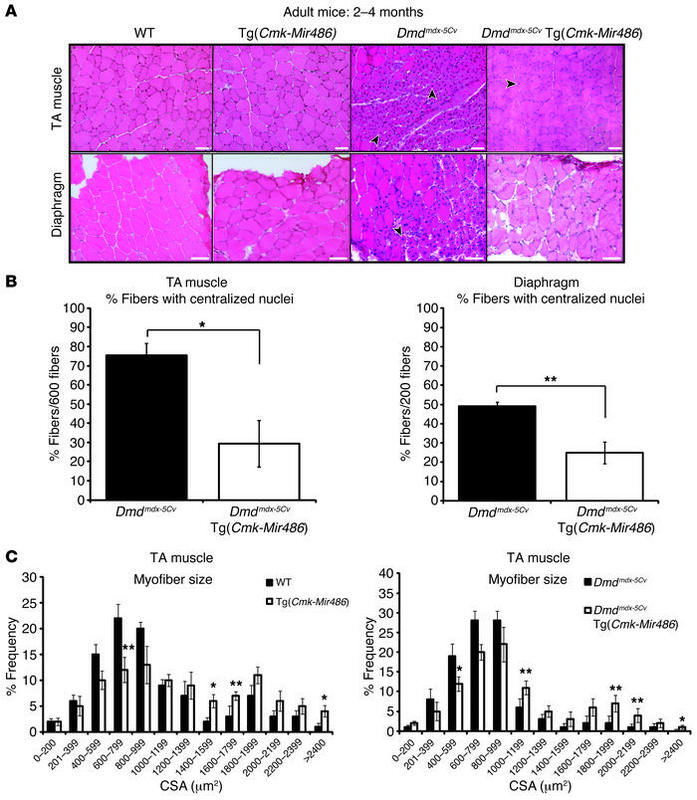 Overexpression of miR-486 in dystrophic Dmdmdx-5Cv mouse muscles reduces dystrophic disease histopathology. (A) H&E staining of adult TA and diaphragm muscles from WT, Tg(Cmk-Mir486), Dmdmdx-5Cv, and Dmdmdx-5Cv Tg(Cmk-Mir486) mice. Arrowheads demarcate centralized nuclei, a classic finding in dystrophic disease and regenerating skeletal muscle. Scale bars: 50 μm. (B) Summary graphs of centralized nuclei counted from the TA and diaphragm muscles of adult Dmdmdx-5Cv and Dmdmdx-5Cv Tg(Cmk-Mir486) mice. (C) Fiber type cross-section area analysis of the TA muscles of WT, Tg(Cmk-Mir486), Dmdmdx-5Cv, and Dmdmdx-5Cv Tg(Cmk-Mir486) adult mice. Six-hundred fibers from 5 separate mice per cohort were used for analysis. *P < 0.005; **P < 0.05. The mean and SEM values for the 4 genotype cohorts are as follows: WT (773 ± 27), Tg(Cmk-Mir486) (907 ± 19), Dmdmdx-5Cv(691 ± 42), and Dmdmdx-5Cv Tg(Cmk-Mir486) (815 ± 36) measured in μm2.